When it comes time to remodel a bathroom, new tile is often top of the list. Not just for floors - tile mosaics or tile walls are also high on homeowners' lists. Tile is trendy right now! There are so many styles and colors available in tile today that it makes remodeling a bathroom fun. However, what's just above tile on that list for bathroom remodeling? Budget. 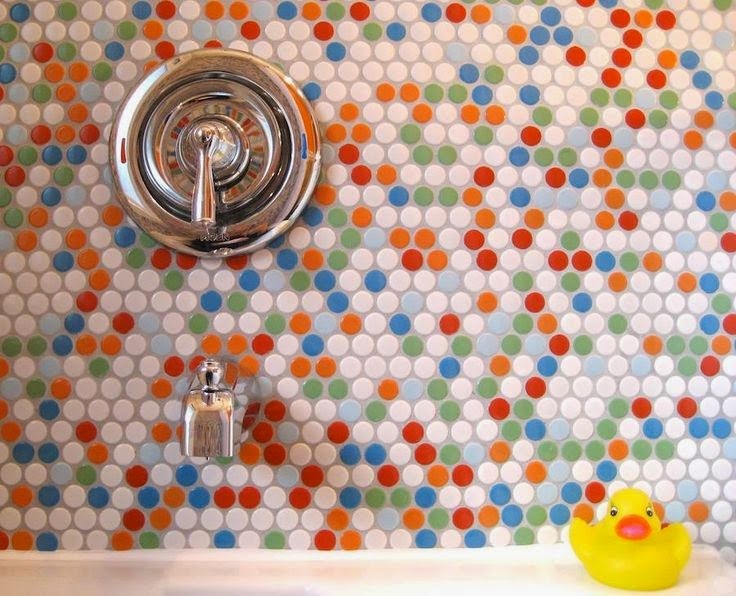 We've got some tips to help you make the most of your budget with bathroom tile. Make a big impact in a small space. Pick a bold or unique tile and find a small area for it. Perhaps a section of wall between the top of the sink and the mirror. Maybe a short wall beneath a cabinet. 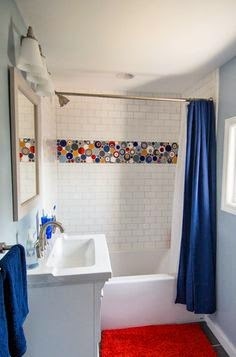 Or consider using the first few inches above your tub for something fun and colorful as a trim before you get to the standard (and economically priced) white tile walls. A bright, bold tile doesn't need a large area to make a big difference. Make a statement on one wall. Take a step into your bathroom and see which wall you notice first. That could be just the spot for a tile mosaic or a floor-to-ceiling application of tile. Glass tiles, mirrored tiles or stone tiles - or even a mix of two styles - transform the look of your bathroom and allow you to use lower cost paint on the remainder of the walls. Go for a backsplash over an entire wall. Yes an entire tile wall can make a great statement in a bathroom. However, it might not fit in your budget if you're also looking at installing new bathroom fixtures. How can you still get that tile look and feel and stay within budget? 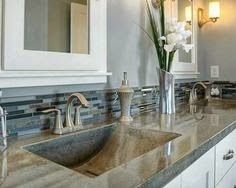 Define a backsplash area of the bathroom and use tile there. If you extend the backsplash across more than one wall you can make just as large of an impact as having one complete wall of tile. Find more inspiration from our Houzz idea books. What about your bathroom tile floor? When it comes down to budget, ceramic tile tends to win for a bathroom tile floor. Professionally installed and protected with a glaze, this tile is easy to maintain, resists wear and tear and will last for years and years. Learn more about the pros and cons of tile floors in Kermans Tile Flooring Buyer's Guide. Bring your ideas and your budget to Kermans - located on the northside of Indianapolis in the Castleton area - and our free design staff will help you find just the right fit.